This little boutique is tucked away on the first floor (Tokyo-themed floor) of Terminal 21, next to Sweet Drug and a few other aptly named shops. This Thai designer started with a shop in Chatuchak (Shop 225. 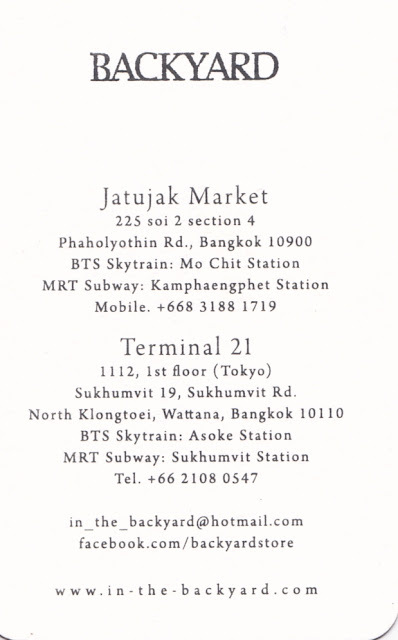 Soi 2, Section 4 - see card below) and recently branched out to Terminal 21. Cropped tops, screen print T's, knit tank tops and high waisted shorts are his style. Lots of cute enamel rings and gold necklaces with charms. I picked up the orange printed ombre crop top on the mannequin. More info on Terminal 21 and Backyard's Facebook. You can order from their Facebook page and they even ship internationally! Thanks for introducing another gem at T21. What's the price for the necklaces with charms? Approximately. I feel like every time I discover something you have already been there first! Every time I discover something new you have been there first! I am such a follower! Hi Claire! Thanks for your comment :) I try my best.. probably explains where all my money goes!